Ricky appears to be relaxing in the dugout or bullpen, This shot was likely taken during BP and Botallico won't need to take the field for several hours. I am sure staying loose with a couple of tosses of the old pigskin isn'a a bad idea. Today Ricky is still in the Phillies family working the the pre- and postgame shows for Phillies broadcasts. 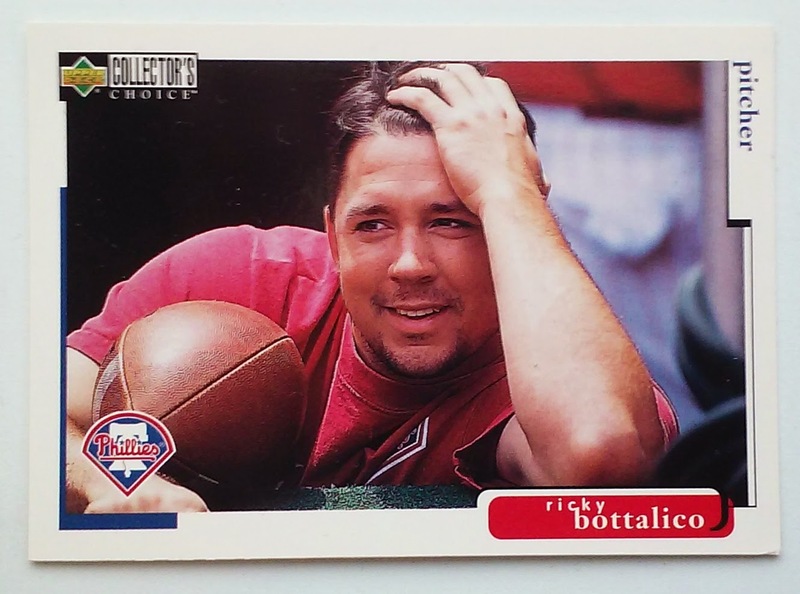 There in no shortage of baseball cards with football references. Among the recent ones is the 2014 Topps card of Mark DeRosa who was a QB at U Penn and also the Sean Doolittle card which features an Oakland Raiders sign. There are even cards of Hall of Famers working on their football skills. 2015 marks the 100th anniversary of the Phillies first pennant winner - The 1915 Philadelphia Phillies. Last week the Phillies announced the candidates for the teams 2015 Wall of Fame election. I knew most of the names but came across one I was not familiar with, Fred Luderus. Fred Luderus was the captain of the 1915 Phillies squad. That season was arguably the best campaign of Luderus' career, he finished 2nd in the NL in batting average, Slugging, OPS, and oWAR. He took his fine season into the World Series where he batted .438 and hit the first Home Run in Phillies Postseason history. As a left handed power hitter, Luderus had 84 career Home Runs. That number may seem modest today, but he placed himself in the leagues top 10 for the category eight times. He also found himself on leader boards for RBIs, Total Bases, and Games a number of times. 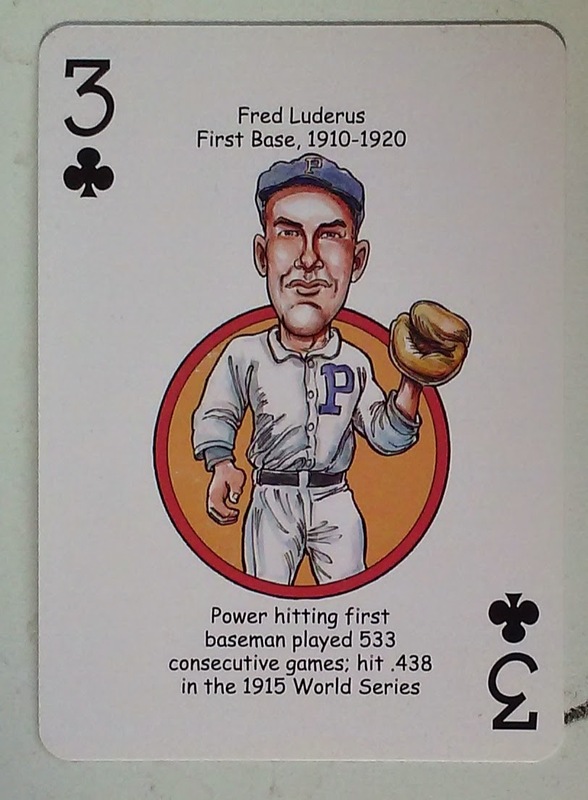 At one time Fred Luderus was the owner of the consecutive game streak record that would later be the property of Hall of Famers Lou Gehrig and Cal Ripken. Luderus played his 479th consecutive game on August 3rd, 1919 surpassing Eddie Collins record of 478. The streak extended for the remainder of the 1919 season ending at 533 games on September 28th. The record held until 1927 when it was broken by Glass Arm Eddie Brown. Following his Baseball career Luderus returned to his native Wisconsin and worked at the Milwaukee Yacht Club. He eventually started his own toy business that sold yarn dolls and animals nationwide. Fred Luderus died of a heart attack in 1961 at age 75. Just wanted to let you know that I still have at least a half dozen posts left in the 1964 Phils series. I hope to get to them, but I didn't want that to hold up the new 1915 series. This is an index of posting related to the 1915 NL Champion Philadelphia Phillies. The Series originally ran in 2015, celebrating the 100th anniversary of the team. Late Friday Night we got the news that Ernie Banks passed away a week shy of his 84th birthday. I never got a chance to see Ernie Banks play, He retired when I was four, but I did get to see him at the 2008 Futures Game in New York. 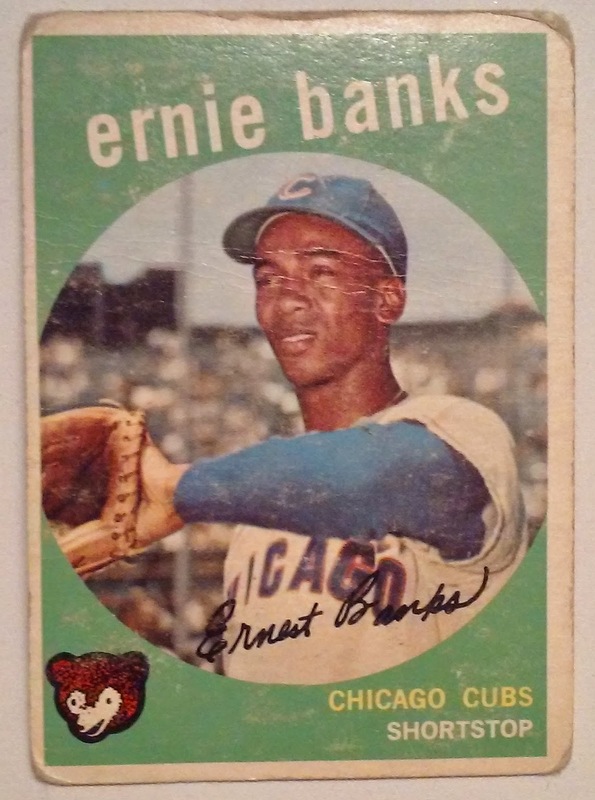 In 1959 Ernie Banks won his 2nd consecutive MVP award. The season was honored as part of the 1975 Topps MVP subset. 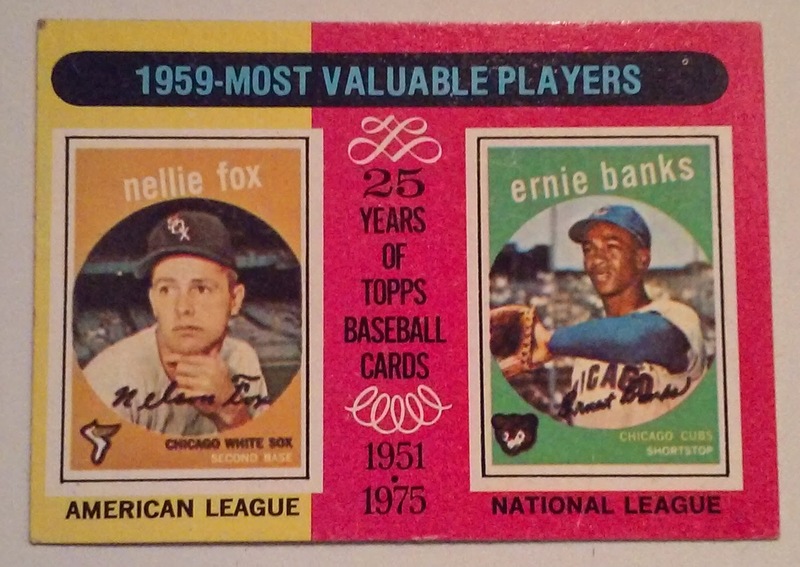 The flip of the 1975T card snapshots sums up a few Banks accomplishments in the 1959 season. Modern analytics agree with the MVP votes of 1959 voters. Banks had a 10.2 WAR in 1959, it was the highest of his career and led the National League. This is a nice base card of Banks, most of the 1959T cards are straight up head shots. I like seeing the glove in the shot and it appears that Mr Cub was captured at his playing home, Wrigley Field. 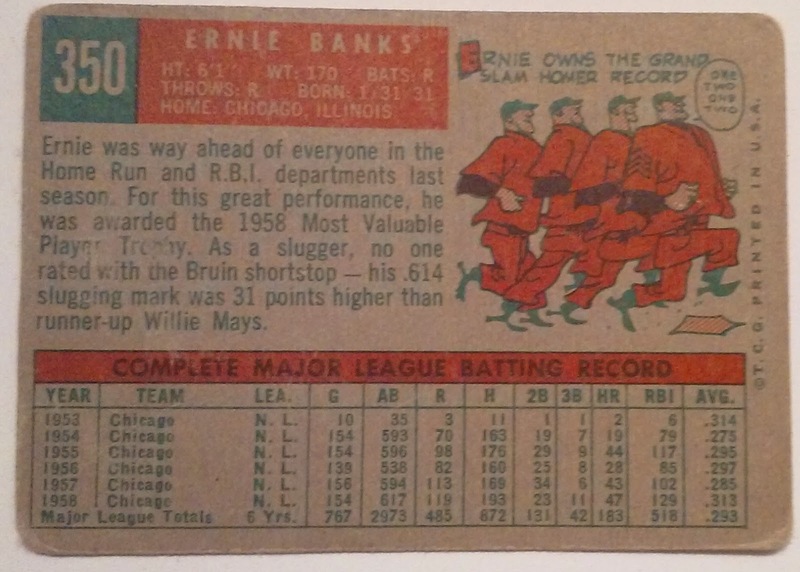 Once again we flip the card and see that Banks 1959 card summarizes the accomplishments that earned hims the 1958 MVP. Ben Revere is good at one thing hitting singles. Even his plus speed doesn't seem to translate game changing stolen bases or stellar defense. They aren't really any contemporary comps for Revere. I looked back at some old Baseball America Prospect Handbooks which suggested a ceiling of Brett Gardner. At this point I would be happy with an Austin Jackson. A sobering thought is that Willy Taveras is closer than those two outfielders. Revere is entering his age 27 season - Taveras has been wallowing away in the minors since finishing his age 28 season in 2010. With Ben Revere having no peripheral skill beyond the one base hit, I seriously wonder if he will be in the majors beyond 2016. This year I elected to continue a feature introduced last year - Hardware. That is how I refer to awards won by different players - For each award card the hardware title is placed above the player name and backlit in bright yellow or gold as I choose to think of it. The Roberto Clemente award is presented to an MLB player who is noted for their sportsmanship and contributions both on and off the field. The process involves nominations from each team, fan voting, and a select MLB panel which includes Bud Selig, Rob Manfred, and Vera Clemente - Widow of Roberto. This year the vote resulted in a tie between Jimmy Rollins and Chicago White Sox first baseman Paul Konerko. I have made an additional nod to Roberto Clemente here by placing Rollins on card #21 - The number worn by Clemente. I would like to see Topps honor card #21 and #42 (Jackie Robinson) in the same way. Rather than retiring the card number (#7 Mantle) why not give it each year to a deserving player. It would give collectors another discussion point in the hero number conversation. 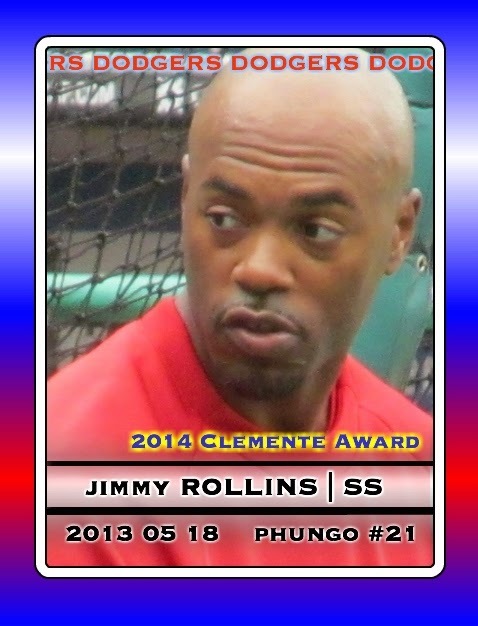 I originally had a totally different Phils card for Rollins. The Picture was from a game versus Seattle on 8/19/2014. 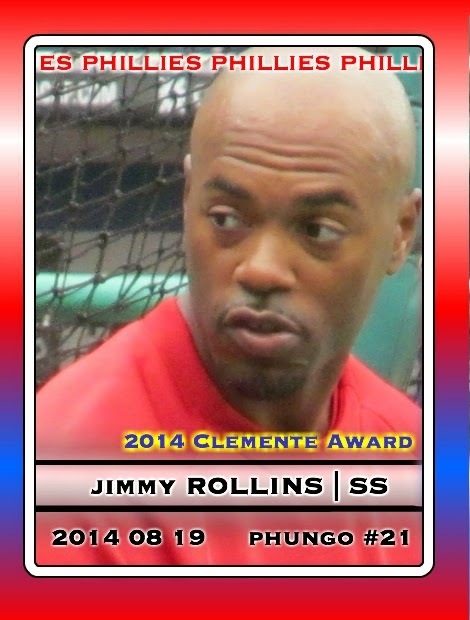 But the photo featured Jimmy in a cap and wasn't really suitable for a traded type card. Once he was traded I found this non-cap pix and quickly made up the above Dodgers card. 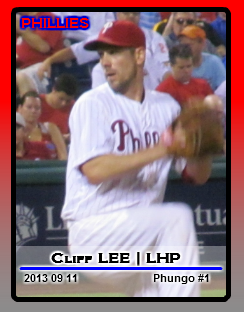 I then took the pix and inserted it into the Phillies template, but I forgot to change the date. Beyond the border differences the cards are still slightly different in the way the photo is framed. Check Jimmy's left ear. It touches the frame on the Phillies card but does not on the Dodgers card. For some reason I am still a sucker for parallels. Target is my desired pickup point for retail largely because they have the red border parallels, which match up better for the Phils team colors than Walmart Blue. However, creating cards for the Phungo Sets makes me realize how flooding a set with parallels is just plain lazy. It is pretty much as simple as taking the A card and point and clicking on the boarder - make less of the B card and call it a hit.